Here are five more knitted hats. All made using basic hat pattern. 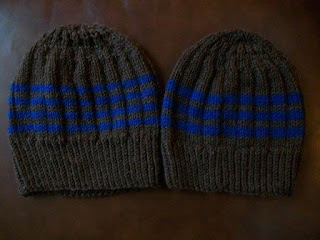 These two brown/blue hats were made using I Love This Wool! yarn (brown) and left over blue yarn (unsure of brand). 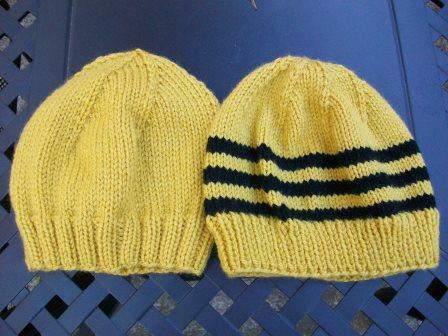 These yellow ones were made using left over yarn that I think is Cascade 220 Superwash. The black yarn strips of left over yarn (unsure of brand). 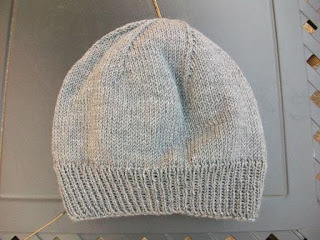 This soft gray hat was knit using Zarina by Filatura Di Crosa.